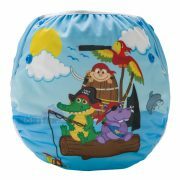 A reusable swim nappy is very convenient & easy to use. One nappy can be used from baby (approx 6kg) to Toddler (approx 17kg). These nappies will fit the average 3-4 month old to an average 2-3 year old. 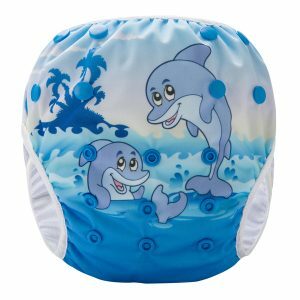 Swim nappies make a great baby shower gift as it’s something that baby won’t outgrow for a long time and very useful gift for the family. 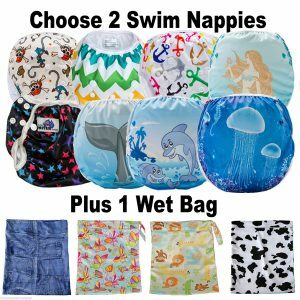 Using these washable swim nappies will mean no more disposable swim nappies which get very expensive (at nearly $1 each!). 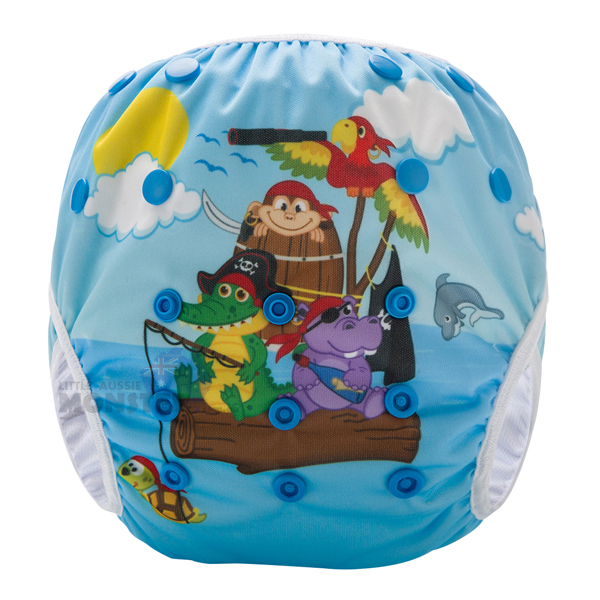 All you need is the swim nappy, no inserts or other nappies are needed. 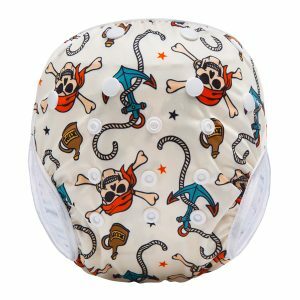 Just pop this onto your bub and make sure the swim nappy is a snug fit everywhere. The bottom snaps are used to adjust the nappy so it sits lower and tighter around the legs and waist. Once you have found the best fit your child, you don’t need to undo the snaps again until you need to change size as they grow. Just Machine wash in cold or warm water after each use and you’re ready to go again. – avoid bleach including napisan. They feature side & front snaps for adjustable sizes, a mesh inner to hold solid (and not so solid) messes. They also have a soft leg elastic and waist binding for a snug fit which helps to keep in the contents in the swim nappy and out of pool water. 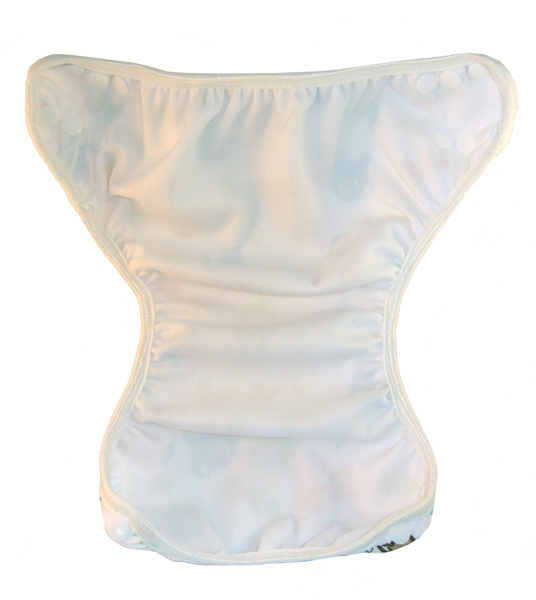 Swimming nappies are not designed to hold in urine, this is the same for disposable swim nappies too. Ensure the leg and waist are a good snug (but not over tight) fit to ensure soft/running poos are kept inside. The legs and waist can be adjusted separately to help fit many different shapes and sizes. Hot tip: Once finished swimming, check the swim nappy from the top, not the side. This will stop any surprises from coming out the side when checking! 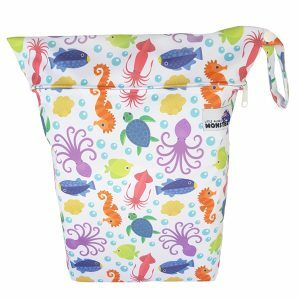 You might also like to look at Wet Bags, these are great bags for damp swimmers, clothes and towels. They can also be used for dirty nappies or wet clothes when toilet training.